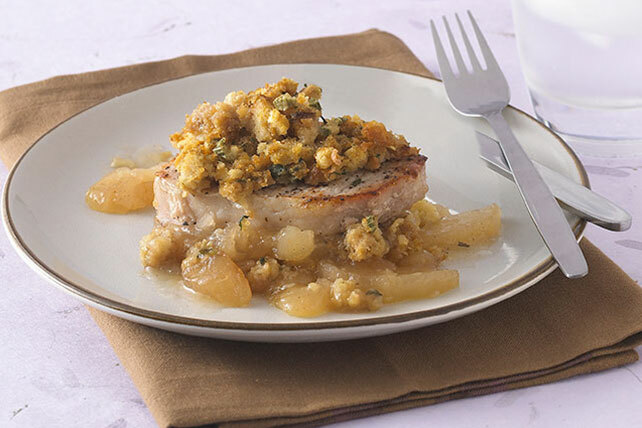 Discover how easy it is to make our Apple Pork Chops and Stuffing any night of the week. Our Apple Pork Chops and Stuffing preps in only 10 minutes. Bake 35 min. or until chops are done (145ºF), uncovering for the last 5 min. Remove baking dish from oven; let chops stand 3 min. before serving. Prepare using 6 boneless skinless chicken breasts, and increasing the baking time as necessary until chicken is done (165ºF).